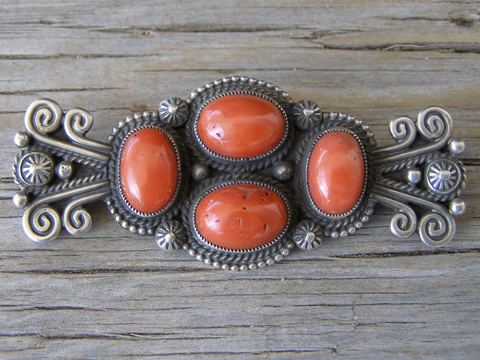 This pin is set with four ovals of natural, undyed Mediterranean red coral. This is superb coral and the impeccably detailed design elements of this pin include starred buttons, raindrops, wire scrollwork and raindrop wire. Red coral: 2 ovals 1/2" x 3/8"; 2 ovals 1/2" x 5/16"
Dimensions of pin: 2 1/2" x 1 1/16"
Length of pin mechanism: 2"